This bat is not for children it is breakable and weighs about 5 pounds. Unless you have previously purchased one of these bats from us, you have never seen a bat like this! In commemoration of Christian Yelich's 2018 NL MVP award, we are proud to release this very limited Translucent Art Bat. This beautiful 34 inch Translucent Bat is one of a kind and made with exclusive and cutting-edge technology. 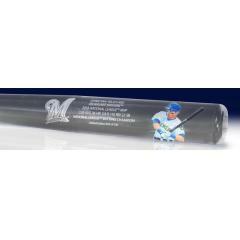 Each bat features the Brewers’ logo and all of his MVP season stats. The bat also includes a reproduction of exclusive original artwork by famed sports artist, Jolene Jessie, displayed prominently on the barrel. To help avoid smudges and fingerprints each bat comes with a special pair of white gloves for handling. Due to the very limited release of this item we must charge your credit card for the full amount immediately upon receiving your order. This policy ensures we reserve a bat for you. We will confirm your order by email. Please allow 4-6 weeks for shipping. This bat is not game used and may shatter like glass if dropped.